Size: approx. 12 mm. Photo: 05/14/17, 1 pm. 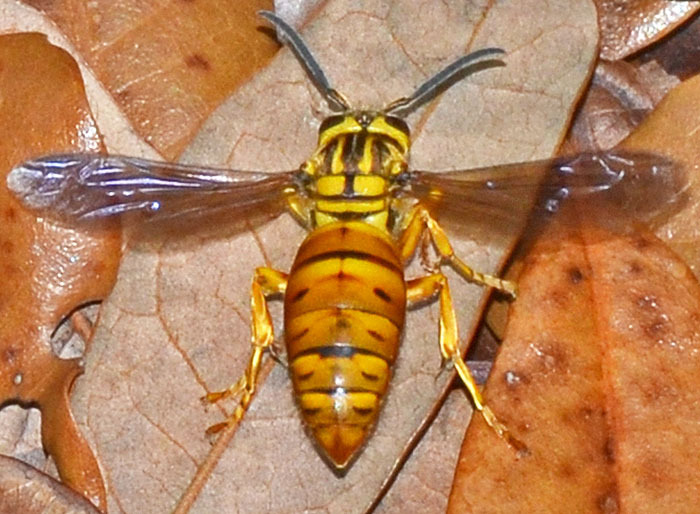 The southern yellowjacket can be identified by its distinctive black and yellow patterns. This one is likely a queen (see UF link, Fig. 2). They create enormous, multiple-comb nests. One of the largest reported nests was 114 cm (45") in diameter. Their stings are venomous causing pain and workers can sting several times. On the upside, they also destroy many insects that otherwise attack cultivated and ornamental plants.